This is definitely one of my favorite monthly subscriptions, I still get surprised every time I receive my little red box full of amazing organic samples! My "A Kiss To Build A Dream On" box contained Snack Olives by Mario Camacho, Dark Chocolate Crepe Dentelle by Gavottes, Restaurant Style White Bean Chips by Beanitos, Dark Chocolate Covered Blueberries by Emily's Chocolate, Honey Graham Sticks by Back to Nature, PureNates Dark "Chocolatey" by TCHO, "Mokaccino" Serious Milk Chocolate + Blue Bottle Coffee by TCHO, Chocolate Chip Biscotti by Biscotti di Suzy, Black Truffle + White Cheddar Popcorn by 479 Degree Popcorn, and Chocolate Truffles by Guylian. A kiss of chocolate, a kiss of honey, a kiss of salt - This box had me dreaming of delicious HEALTHY snacks! I honestly felt like a little kid waiting to open a new Christmas present, this is such a fun way to discover new treats! 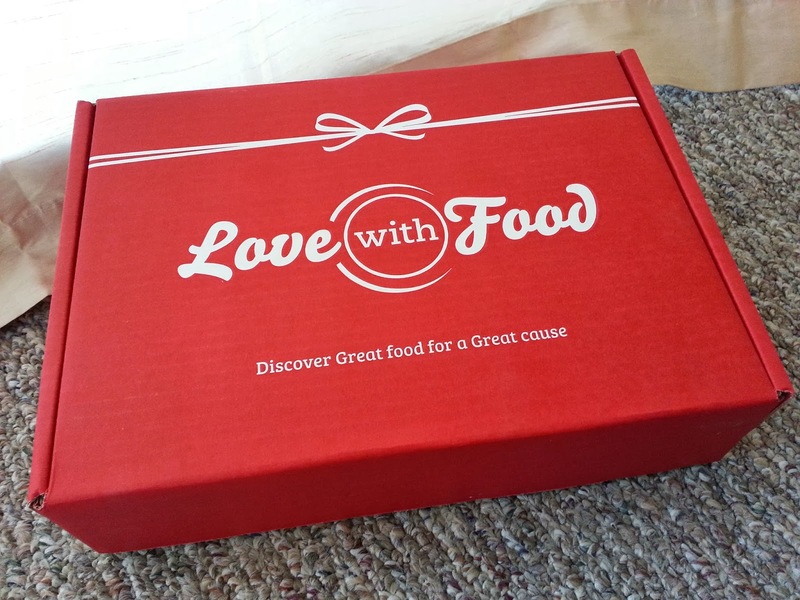 Love With Food is giving one of my lucky followers a 1 month Deluxe Box subscription, pretty cool huh?! One (1) winner will receive: A 1 month Deluxe Box subscription to Love With Food. Ends 2.19.14.
love that they donate a meal! how fabulous! I love that they donate with every purchase! I love that everything they send is healthy! I love subscription boxes like this! Especially when they are healthy and organic! That's great that they donate proceeds from each box. I love when companies give back! And those chocolate covered blueberries sound yummy! I love the snacks in the box. I love that you get to try new things. That they have such a cool charity-minded focus...and great products! What a great subscription box! I love the amount and quality of the products you get for 10 a mth! Oh this looks so good! I would love to have those snacks. I love that they donate a meal with every box purchased! I really love how it is a surprise to the person receiving different snacks and all that. It looks very yummy. Another big thing that I adore, is that they donate a meal! That's really amazing. I love that they donate, wonderful! Im excited. This is a really great product. It not only ices to you but also gives back. 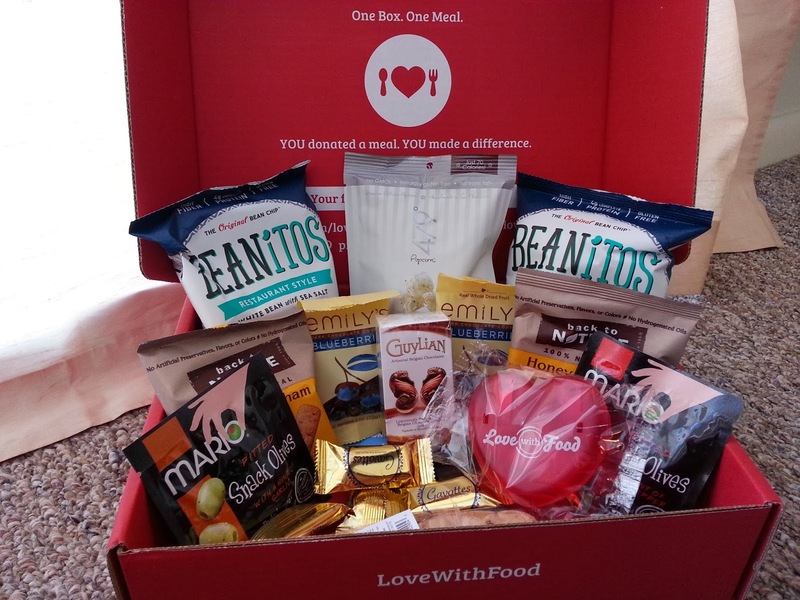 I get a love with food box too only not the deluxe one. This was only my second box but I don't think you can beat if for the price. I love these! I wish someone would buy me one as a gift because this is the gift that keeps on giving. We gave a subscription as a gift and it was well received. I LOVE the idea of healthy good food being sent! I've never heard of this box before but it sounds great - I am trying to turn my family's health around by eating organic and healthier foods so this is perfect!